“I want to go green and be eco friendly, but if I do, how will my customers know?” This is the question that many commercial kitchen operators have been asking as the green movement gains momentum. 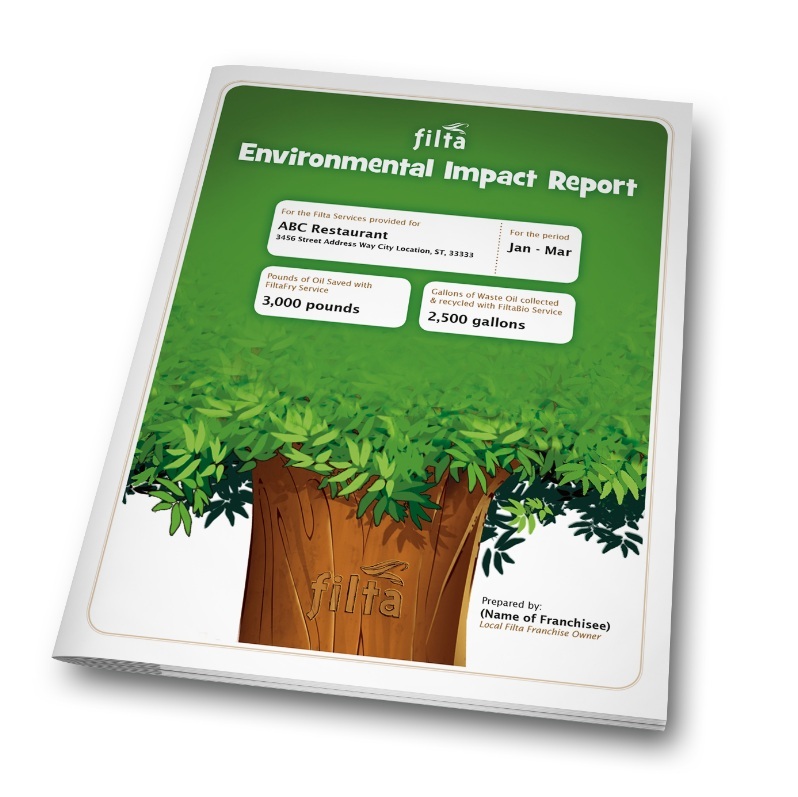 Fortunately for Filta’s customers, the environmentally forward company has just rolled out its Environmental Impact Reports. The Reports are able to quantify the positive impact that Filta Franchise Owners are making on the environment and serve as a two way avenue of communication. The first shows the educational arm of Filta’s services and why they are making such an impact. The second avenue quantifies the impact of Filta’s Fryer Management services. As Franchise Owners explain the reports, they have the option to travel two avenues. The educational route takes commercial kitchen owners and operators through the production aspect of how cooking oil is created from the seed to the fryer. Along that journey, facts are given about the process, like it takes 1.2 pounds of plastic to create the “jug in a box” packaging. As one reads through the report, one can see why Filta’s services are making such an impact. Additionally, Franchise Owners are able to generate their own, customer specific reports. This road allows commercial kitchens to benchmark their individual results. For example, the carbon offset of saving and collecting 1,000 pounds of oil equates to planting 168 trees! Contact your local Filta Franchise Owner to get a glimpse of these innovative reports!